Want to play chess with a human? 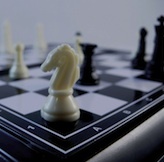 The Chess Club meets every Wednesday, during the school year, with Stephen Greenspan as our chess leader. Truly an inter-generational experience, all ages and levels welcome. Come and play!